The Hame 3G Wi-Fi Router is the next best thing to happen to my traveling escapades after purchasing my current Samsung Galaxy Note. I love this pretty affordable device that has been a very big asset to me. To some, the name “Hame” as a brand could be so strange to them, well that was how it was with me at first. Hame 3G Wi-Fi Router is a 3G Wireless Modem from a top Chinese Company,Hame Technologies. Since the production in early 2012, there has been series of models, the most popular one being HAME MPR-A1. The HAME MPR-A1 3G Wi-Fi Modem is 100% compatible with 3G, HSPA+, HSPA, CDMA 1X EVDO USB Modem, iPhone and android. It is also compatible with all latest versions of Microsoft windows starting from Windows 2000, It can also run on Linux operating system. The HM-A1 Wireless Router also has a built-in battery of 1800 mAh capacity which provides a continuous operating time of 3 to 6 hours. You can charge the battery using a mini USB port or through a power adapter. It can also be used effectively as a power bank for charging mobile phones including ; iPhone, android and most Chinese phones. Another awesome feature of this device is the ability to connect an iPhone to it for sharing your internet connection without having a 3G USB modem. The Hame MPR-A1 3G Wireless Modem can work as Mobile power bank for charging iPhone, android phones, tabs, iPad and other smart phones. It comes with a built-in Ethernet port, which allows it to convert cable broadband to Wi-Fi. You can also use it to extend other Wi-Fi network instead of purchasing a different access point. It is fully compatible with more than 420 kinds of 3G USB modems including Huawei, ZTE, Alcatel, Vodafone, D-Link, TCT, Epivalley and many other brands . It also Supports the sharing of data plan via iPhone. With a Built-in 1800mAh Li-polymer battery the Hame MPR-A1 3G Wireless Router supports the charging of iPhone battery, Powers 3G hotspot for hours without direct power or USB connection. You can easily find out how much battery power is left by pressing the battery indicator button. The Hame MPR-A1 3G Wireless Modem comes also with a Built-in Ethernet port that makes it very easy to convert LAN to WiFi. It also lets more people surf the internet under the WiFi coverage area by serving as an access point used for extending WiFi connections. We have already outlined several 3G modem that’s fully compatible with Hame MPR-A1 3G Wireless Router. It makes the making of WiFi connection seems so easy. The video below will guide you in English Language and you can also ask us any question using the comment section. When I first purchased the Hame MPR-A1 3G Wireless Router, I was shocked to see only Chinese manual with no single English references in it. I visited their website and found that one even harder than the guesswork I was doing all night trying to figure out a way to manually add my local APN settings to it. This tips should guide you on basic settings needed to get all your Hame 3G Wi-Fi Modems working properly as a non-Chinese customer. Maybe Hame didn’t expect their product to go as for as Africa, Europe and America without remembering there’s eBay, aliexpress and Dhgate. This is very much like that of the admin details ==> Just hover over “Wireless” from the main menu and select “WIFI Settings” ==> Change Network Name (SSID) and Pass Phrase from there. Remember to select a security mode or leave it at the default option. Everything about Hame 3G Wi-Fi Router is automated from setup to connecting to the internet, but most mobile telecoms operators do not support automatic profiles and as such will need a manual APN configuration. If you are using this modem in Nigeria or using any of the Nigeria telecoms service provider, here is the various APN settings that should work for you. If you are outside Nigeria, Ghana, Kenya, South Africa, Germany, France, Mexico and Jamaica, you can visit here for a more comprehensive list of APN settings or get them from your network providers over the phone or from their various websites. 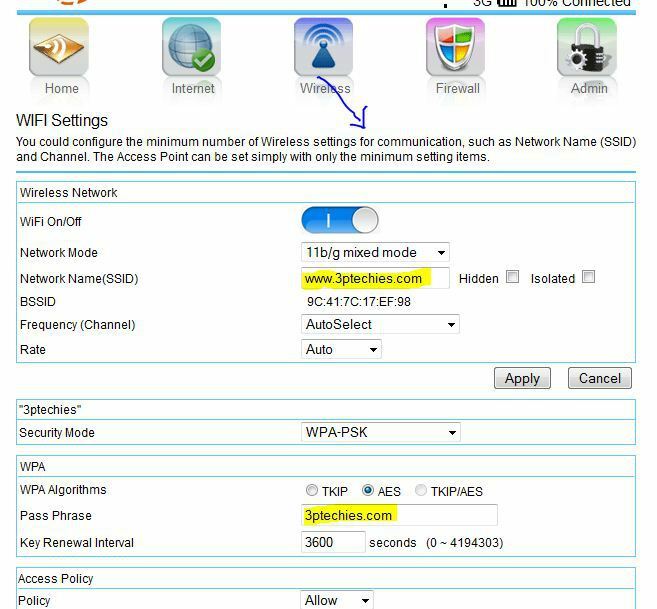 Other advance features that’s available in the Hame 3G Wi-Fi Modem admin interface can be tweaked following the above examples. I have also uploaded the Hame 3G Wi-Fi Modem English Manual here for download. Drop your challenges below, if there’s any. Hi I am trying to access the address as specified but the wifi is off in settings page from then im unable to communicate with hame router. Also guessing you might have faced issue what I’m getting. I Google and found to reset the device. I did about 8 times then it got restored and able to reset WiFi password. Is there any why to make HAME to accept more then one device to connect. I have two android and one Symbian mobile and PC. I am successfully able to connect to PC and one android (2.3.5) mobile, another android(2.3.5) and Symbian devices are not able to find WiFi, if found not been connecting. Sorry for a long story. if interest please respond or delete the comment u have rights to do.. I understand how frustrated you are with my not providing a satisfactory answer in my previous reply to your challenges..
Trust me, I didn’t mean to do so and that doesn’t mean I’m new to tech gadgets and how to troubleshoot them …..
suggested your pc isn’t able to communicate with your 3g router, that was what actually prompted me to advice you check your driver and other wireless related tips. Concerning your new challenge; I will advice you log on to http://192.168.169.1 from your favorite browser and ==> change the SSID and “security mode” ==> toggling from “dynamic” frequency to a specific (static) one can also aid your troubleshooting. One you switch to something new, save and check if that works in positive direction.. Normally, up to 20 devices can connect and use your 3g router simultaneously .. I haven’t personally faced this problem myself, hence, my reason for providing only tips and idea …..
1. Can you provide further details like what error message you normally get when trying to add a new device? 2. Have you tried using the WPA-open ( Wi-Fi Adhoc, open) without success? My first question to you was the After turning off the Hame router WiFi in settings page. But that doesn’t addressed the issue so i found a reset option which resolves the issue but except other mobile device I am able to connect hame router to another rmobile and PC. I will try u solution..
Have you tried contacting their support @ http://hamedata.com/ or any of their retail store? Yes, I did found at Hame site FAQ section to reset device to restore the WiFi settings. The retail store where i brought no one get faced to it nor they know how to resolve. Yes , I have reset it , still its not transmitting the wifi signal. my laptop/mobile is not detecting the signal(i have checked mobile/laptop wifi setting). the blue light is blowing in dim (low brightness) . Repeat the reset untill see the red blink goes and blue blink start’s and do make the device full charge don’t leave it connected to charge even its full charged. Hi, I did reset no of times then it got reset and get proper working now. from few days the device is getting reset by itself. I dont know what is the reason. Hi Vikas, I did reset with papaer pin hold for 10 seconds untill the red indicator start blink remove the pin and see the blue blink indication continuously then connect with ip and do settings of your data card. Mine is Reliance data card #777, user namme and Pwd data card number and works great. since you diabled wifi you cannot login wirelessly. plug in your LAN cable to both PC and router and enter address mentioned above. then login to the dashborad page as usual and turn wifi back on . I am not able to connect MPR-A1 3G Wi-Fi Router after setting up the password. I am getting error : Authentication error occurred” in my mobile/Laptop while connecting. I need help to reset the router to factory settings or if I can get over this error. Thank you so much in advance. resetting your modem is quite easy, all you need do is ==> locate the tiny “hole” by the side or back of your 3g modem. What message do you get on visiting http://192.168.169.1/goform/setSysLang?en ? Hi, my device unable to establish a connection with my dongle. hope you are able to advice thanks. What message do you get and have you tried resetting the device? btw have you connected this device successfully prior to this time? Thanks for sharing valuable inputs . I have Hame MPR A1 which was working well with Tata Indicom CdMA 3g stick but could not work with Vodafone ZTE stick. On check found that the perticular ZTE model is supported by Mpr. Please tell me how to resolve the issue. What message do you get when connected with the Vodafone ZTE stick? Unable to access the IP address provided, the error message is “Internet Explorer cannot display page”. I tried connecting to LAN cable and I had it reset using a paper pin for the no. of times but still no internet connection. Its yours a wi-fi modem? and have you tried connecting via the wi-fi adapter on your pc using the troubleshooting option that came with Window to find out what the issue might be? Let me hear your feedback concerning this two. I am unable to connect Hame MPR-A1 with Tata photon 3G. can you pls help? Can I get an idea of what problem or the error message you do normally get when trying to connect? I do not get any message. The status shows as “Internet not connected”. Am able to connect to WIFI from my PC. But, internet is not available since the router is unable to connect to the Photon 3G. It is a HSUPA MF190 USB Stick from Tata Photon. I am not sure of the problem you’re currently having buddy. But as a test, can you try installing connectify (connectify.me) software on your computer with the USB modem connected to the PC instead and check if that allows your phone to browse the internet. This will allow me give other advice from here, else you may need set correct APN values from your network provider. H ave you tried using a pin to insert in the small hole beside or at the bottom of the modem? You might need run the config again on your browser once the modem is reset ted. Hi i did the same bad thing and now i’m unable to connect router and get access. what should i do now? any solution ? have you tried resetting the device following the tips above? hi. my hame R1 doesnt dial 3g automatically, and i did setting APN manually, but doesnt start to connect internet, what i must to do ? What happens when you log on to the settings window via your PC’s browser? my router refused to reset the password, what should i do? Are you able to connect to the control interface on PC via the IP address? You’ll will need get in touch with the local support, retailer or get in touch with them via their official website. I can’t lay my hands on any latest Hame wi-fi firmware (for flashing) which could have been an easier solution. Have you tried this method below? It worked for me some time ago. Check if you can get access to 192.168.169 after the restart. Are you very comfortable with flashing of devices? what message do you normally get when trying to connect? i can’t use my device yet. Have you tried putting another call through to the seller? What about the default security keys (hame or admin)? Hi, the defaulf password does not work, I guess something went wrong from the Chinese website. How can I recover the correct password? my hame router can connect with my pc successfully, but for my android device can’t detect the wifi-network. what’s wrong with my hame router? I’m very confused for resove this problem. How many PCs have you connected to it already? I have a problem.. i use my MPR-A1 as a Wifi-router-amplifier.. i want to change my hame modem wifi password but it always shown as “Wifi is connecting, cannot do this”.. and if that message was shown i try to disconnect this wifi and enter to the security menu again but those problem still happend.. If I understand you Faizir, your modem works correctly only that you want the password changed right? can anyone help me in getting firmware update for hame-r1 router mine is getting restart . Do you still need a help with this patale? i am using last three months and i hv no problem but now i am not be able to browsing pls help.but its hame moderm is connected only not be able to browsing. Looks like a minor issue caused by either a wrong APN value for the network in use or lack of a qualified data bundle plan. Hi Thanks for reply I am using Lan ofiz cable for internet connection and data subscription is still valid .Before i am able to used this hame A2 router but from last 3 months I am not be able to used.Pls help .Router is connected but not be able for browsing.Wrong Apn how to change the Apn?coz i am not changed any setting? HI im using Hame R1 since yesterday and i can’t connect it with my 3g dongle( Huawei e3251). System win8…. Separetly they work fine (internet is working): dongle with computer and Hame R1 with lan cable. Both they just dont. I was trying changing auto to manual apn inserting correct values but it dont work. Lights just blinking. i reseted him 5 times and that didnt change thing. Official site is on Chinese and cant understand anything…Pls help. 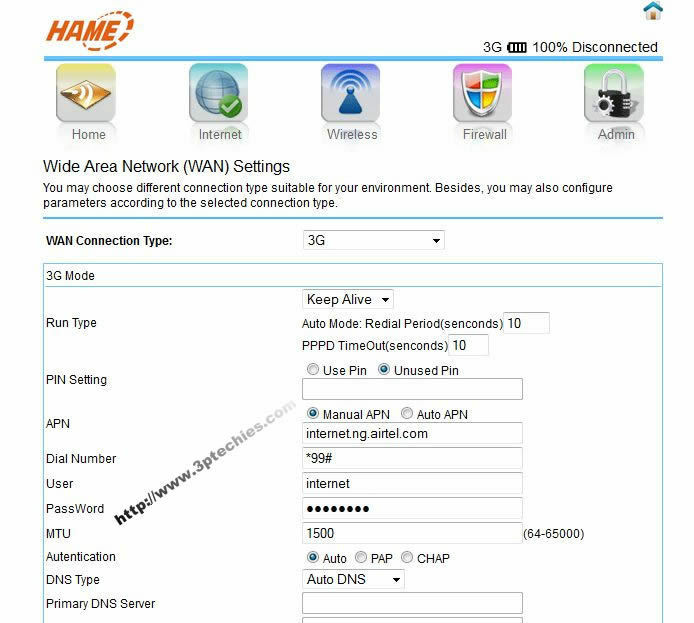 To change the APN values manually, you’ll need visit the IP address provided above while connected via the Hame router and navigate through the settings/network tab. Already did that, typed 192.168.169.1 and in 3g mode i typed apn,dial number,user name and password values of my operaton and clickem apply. It didnt work. No errors dispayed, just limited connection for connection: HAME_A1_d55f , i tried another sim card (another operator, different apn,user,dial,pass) and also dont work. I typed 192…on my phone and i get same settings. Is my 3g compatible with R1? Try this option when next you next the hame 3g router via the PC. Locate network settings from your PC and navigate to “change adapter options”. Locate the hame router (already connected) from the list and right click on it. Then click on the diagnose or troubleshoot option. Allow windows to detect and fix the issue automatically or suggest the fix for you. I’ll study this again and see how other way we could resolve it without re-flashing the custom firmware/software. If access to the retail dealer and/or support website were reachable, it wouldn’t be such a frenzied issue. No error displayed at all. In network it is HAME_A1_d55f limited access. Is my 3g stick compatible with this router? Thank you for the review and english manual. It gives me a great help. You are welcome Mamajin, I’m glad I was able to help. hello,my hame mpr a1 just arrived and i dont know how to set it up because it came without a user manual . ive enterd the url from the device but it does not work could you help me with that ? You’ll need to connect to the phone or pc before entering the address. The English manual is also attached to this post. have HAME F1 and I am using it for wireless streaming. Now I can connect my computer to HAME through wifi but its web interface page on windows, android and Ipad shows media disconnected and I can’t see the Disk icon or Disk name in order to access files. All other functions are working fine. I Have HAME Wireless 3G Router With Power Bank Model R1 But Unfortunately It Displays It’s Settings In Chinese. Please Guide Me How To Change Languge To English. Nor Can Use North I Can Serve Up! I have Hame R1 model working for last 1 and 1/2 years. Now there is problem in router as power back up is almost nil from last few days. Now even online light is not glowing very mildly & internet connection could not been done through router. Any solution . Battery of router gone ? if so , how to solve. How to opgrade FIRMWARE ??? There’s a comprehensive guide for that online Kent, searching on Google with the keyword will point you to it. It’s not detected as Unidentified network. When switching in pressed with a small pin into resetting hole. It’s always blinking both red and blue lights same time. is it possible port forwarding? Are other services relying on data from same provider working properly? I’ve got an older HAMA MPR-A1. But I do not have a WiFi password. Is there any chance to get or change this. I also can to open the 102.168.169.1 address, I think this would only work when I’m connected via WiFi. I only see the SSID: HAMA_A1_eff9. I can ping the 192.168.169.1 but I can’t open them in any computer or browser. Searched the MAC adress from the connected LAN port. If read last 8 digits, but didn’t work. Then tryied and changed the last digit with an 8 and worked. I’m glad you were able to resolve this Sigi.